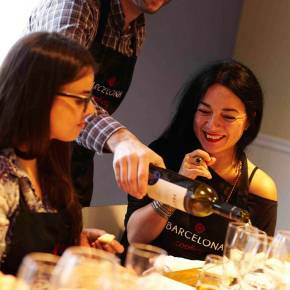 Our Spanish Cooking class highlights the very best from Spain’s rich culinary history along with the most popular Catalan dishes. The four course menu is frequently updated to include local seasonal ingredients and consists of classic paella, starter soup, appetizer, and dessert. 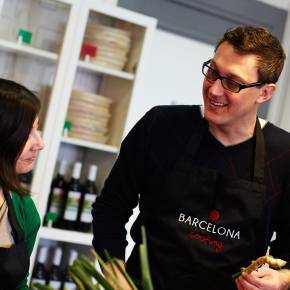 All our classes are taught by the professionally trained bilingual Spanish chefs. We utilize the freshest seasonal ingredients from local markets and farms. 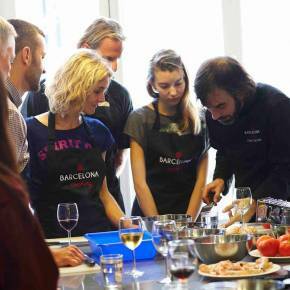 The classes provide a fun, social, hands-on experience, where you will be participating in the preparation of the various dishes under the thoughtful guidance of our chef instructors. Our classes are designed for accomplished and novice cooks, and there are activities in the food preparation process for every skill level. Our private label premium Rioja red and Galician white wines are served while you enjoy the meal you just prepared.All our menus can be adapted to accommodate any food restriction you may have. Please advise us beforehand so we plan accordingly. 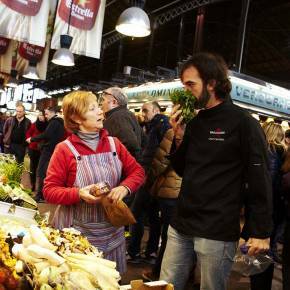 On Fridays only, there is an option to add a Boqueria market visit to your class, starting at 5pm (except on bank holidays).